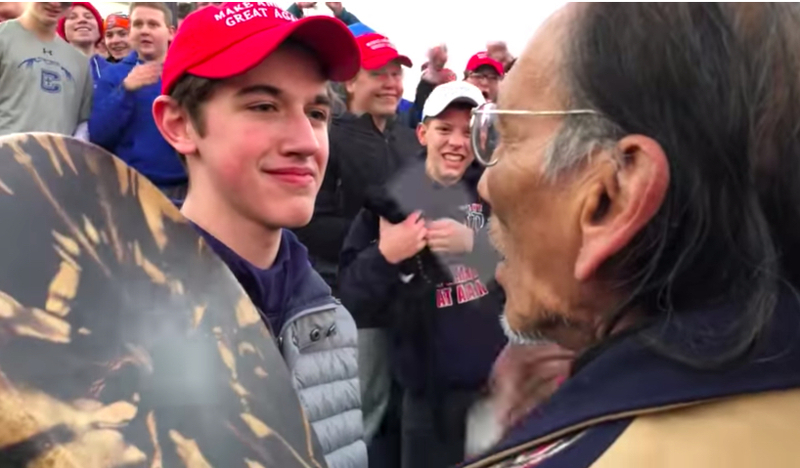 Jay’s father, John Jackson, saw the teacher’s tweets online and immediately responded to her inflammatory comments, assuring her the student in question — who actually turned out to be Nick Sandmann, the teenager at the center of the weekend controversy — was not his son, whom he said was home playing basketball. After another Twitter user, identified as Chris Donahue, criticized Grissom for “outing a kid without any type of proof” — an act he described as “malicious” — the middle school teacher retracted her previous tweets. Jackson, for his part, called the Colorado educator’s actions “totally abhorrent” and “inexcusable,” according to the Highlands Ranch Herald. For those who don’t know, the “Hitler Youth” was established in the 1930s during Adolf Hitler’s murderous reign. It was a group dedicated to indoctrinating children to support Hitler’s ideology and prepare them to fight to advance his goals. In an email sent to parents Monday, Mountain Ridge Middle School Principal Shannon Clarke addressed Grissom’s unacceptable behavior. Clarke followed up with parents Wednesday, when she told them Grissom “is currently on leave,” noting the school was working to ensure a smooth transition for the students in her care. Following the frustrating incident, several parents attended a school board meeting Thursday. Attendees were told before the event began that they were not allowed to reference Grissom’s name during the meeting due to district policy — a somewhat ironic rule, given the only reason they were there is because Grissom herself inappropriately invoked a child’s name online. Regardless, one parent at the meeting, Brad Wan, took the stand and proceeded to use Grissom’s name, hoping to bring the issue up for discussion. He was promptly escorted out of the building. “A speaker should never be removed from this podium for doing their civic duty and speaking to our elected officials,” Wan said. Neither the school nor the district have announced next steps regarding Grissom.